Even the way she smokes tells a different story. The way she smiles around her Marlboro, breathing out a tar-like cloud like it won’t eventually find its way to clot the sky, but you know better. You offer her another one when she’s done with it, but she declines. Asks, instead, how to say, “I’m full” in your language. It’s more boredom than benevolence that you demonstrate, rolling the vowels around your mouth and watching the way she parrots the sound and the way the afternoon light around her dims a little from osmosis, the energy gathering inside her, unspooling into delirious laughter. You’ve seen this before, this strange tourist fever—“I’m not from here.” And yup, there it is: twenty-something, says she left her 9-to-5 to see the world, ride her Julia Roberts great escape into the spicy winds of Third-World Landia. “Maybe even fall in love,” she sighs, and God, you already know she’s seen the ad, the one your government paid big, big money for. In it, your city sits on a high stool, hip jutted out, eyes stormy with promise, well-dressed and charming and every desirable thing. Who wouldn’t want that? Who wouldn’t want to love a city like that, this city you know behind your eyes, by the sound of its footfalls? Raised on Catholic principles, you know judging her wouldn’t be polite. Still, you wonder what the view is like on the other side of the split screen. Hardly anything extraordinary happens here. Already 1PM and the city still drags its feet. Surely, she can see the gaps; big blue alien eyes like that, surely she can see everything: hear its old bones shifting, rattling, sense the danger on its way. This you know too well; stay long enough, and the roots of this place grab you by the ankles and it’s over—next thing you know it’s been years and you can’t leave. It won’t let you. “Look,” she keeps saying, all windowpane eyes and the curtains drawn, then, “Amazing,” and, “It’s more than I ever imagined,” as her juvenile touristy delirium takes hold, so fiercely unmarred it shoves you outside yourself. Stumbling, you look up at your body and start to shake. You imagine, for a moment, what it would be like to possess that nearsightedness again: to see the rain and count each gray window, to track the flight pattern of small brown birds. To see everything, like children do—all this city’s DNA-rooted potential, still warring against sleep-gummed eyes, still shouting, still here, still in you. Andrea Lopez lives and writes in the Philippines. 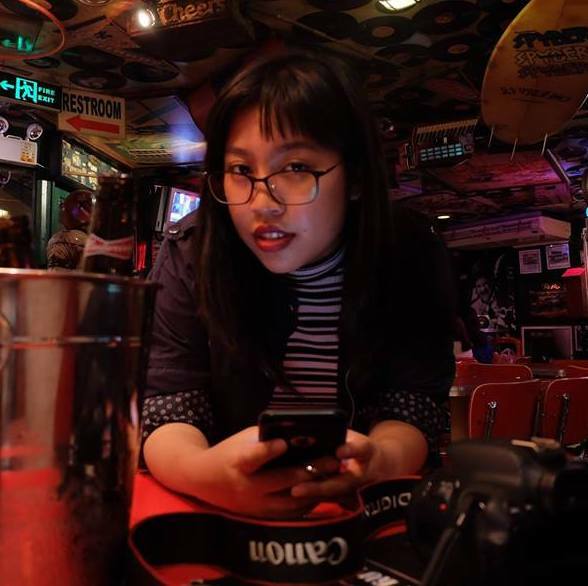 Her work has been published in Cyberriot, Heights Ateneo, The Thing Magazine, and other magazines and anthologies.